Finding Peace Amongst The Hardship. The perfect time to reflect on your year and find inner peace for the festive holiday. This year has been hard. I do believe that I am being tested by all of the challenges though. This mindset allows me to find peace even in the darkest moments and counter the negative events. I share with you all, my reflection of 2018, in the hope that it will inspire courage, awaken empathy and encourage self acceptance. This is a powerful technique adapted from addiction recovery, and the quote inspired by the Serenity Prayer, is a wise reminder to surrender to our challenges in order to move forward. This year, I became a Psychiatric patient, Rheumatology patient, Neurology patient, lost my ability to go out alone, ability to drive, struggled to eat, was unable to walk, had multiple hospital, clinic, doctors, home visit and therapy appointments, was sedated, heavily medicated, wrongly medicated, had to retrain my muscles, my memory, my emotions, had multiple dental procedures, made a bad investment, lost too much weight, gained too much weight, drifted from friends, very sadly lost family and recently, my close friend, Paul. I also regained many of these abilities, set up two incredible businesses, one soon to be a charity, was on BBC News for Mental Health Awareness Week, ITV News for World Mental Health Day, entered Virgin Voom 2018, was assigned an incredible mentor from The Princes Trust and will be working with the trust to develop the enterprise programme for young people, started on the Natwest Accelerator Programme, sold £1000’s worth of stock, been nominated for multiple awards, ran multiple mental health campaigns, spoke up at the Hay House I Can Do It event about how I overcame suicide, met the truly beautiful soul Fearne Cotton and was gifted a journal from her, hosted charity craft classes, coached amazing business owners, received an offer to become a Business Associate with ex Military Intelligence Officers teaching elite influence skills, was approached for a Business Consultancy post with Mind Charity, walked the Great North Run 2018 (in 2:43! ), saved 3 people from suicide, had a front row seat at the Virgin Money Giving Media Awards, met my favourite author, started writing a book and was maid of honour at my best friend’s wedding. So, while this year has been incredibly challenging, it has also been extraordinarily rewarding. By finding peace in the darkest moments, I could feel myself growing, which in turn attracted positive opportunities. I encourage you to open up a similar reflection before the year is through. It is important to identify and accept the negative aspects, and celebrate the positives that followed as a result of space and growth. It can be as simple as making two columns on a piece of paper, setting a timer for 5 minutes to exhaustively write the negatives, and then 5 minutes to enjoy expressing the positives. Peace is created from acceptance, courage and wisdom. Enjoy making peace with yourself during this festive holiday. Let it be the greatest gift you give to yourself this year. I am an Executive Success Coach at EClarity Coaching, Owner and Founder of Piffy & Egg, guest lecturer and speaker. I created my businesses after leaving my career as an intensive care nurse. My JOY is Piffy & Egg, an eCommerce creating happiness through art in aid of the mental health charity, Mind. 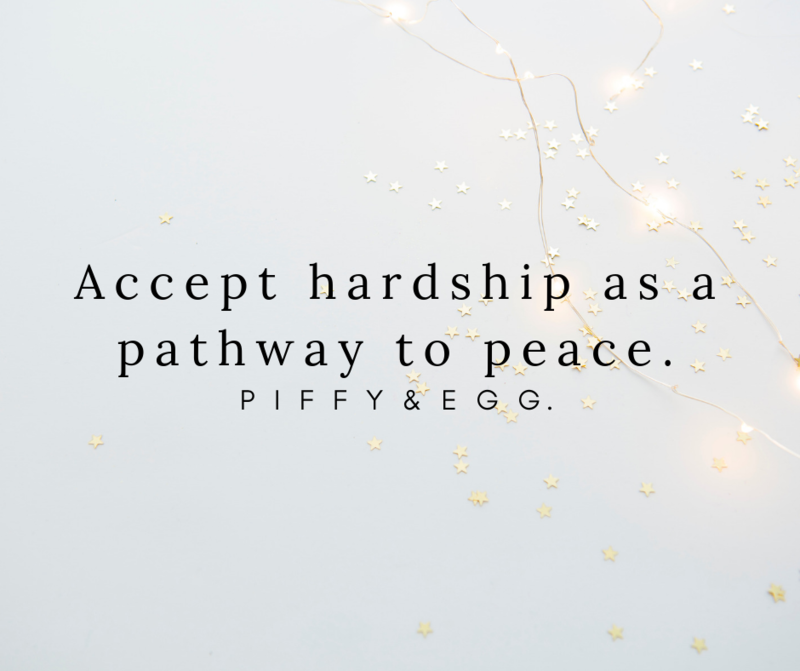 Using art therapy as a low level intervention for mental health recovery, all products are launched as part of wider campaigns taking each member of the community on a journey with Piffy & Egg towards self love, true connection and happiness. I am supported by mentors from The Prince’s Trust and Natwest Accelerator Programme as well as their partners such as Dell. We were featured on BBC news for Mental Health Awareness Week (UK) and ITV News for World Mental Health Day. I created my second business, EClarity Coaching, to work with highly ambitious professionals before they reach burn out; guiding them on their path to success so they are no longer working tirelessly and feeling unfulfilled. I work with individuals and larger organisations alike. I have adapted methods from my career as an Intensive Care Nurse, community teaching and from my own recovery to really nurture and inspire my clients on their journey to happiness. I also guest lecture at local universities and am involved in the recruitment and interviewing stages for perspective student nurses. My work in the health sector continues, and I am currently setting up the UK's first peer-led suicide survivors support group with Recovery College in Newcastle city centre which will be starting in January 2019. This is part of a UK wide project I am collecting data to support and role out across the country.